As you might guess based on the name, Bundle Buster is a pattern designed to help you make incredibly efficient use of a fat quarter bundle. Hawthorne Threads generously donated a 19 piece bundle of their Mojave fabric line that I used to make my version of the quilt pattern. 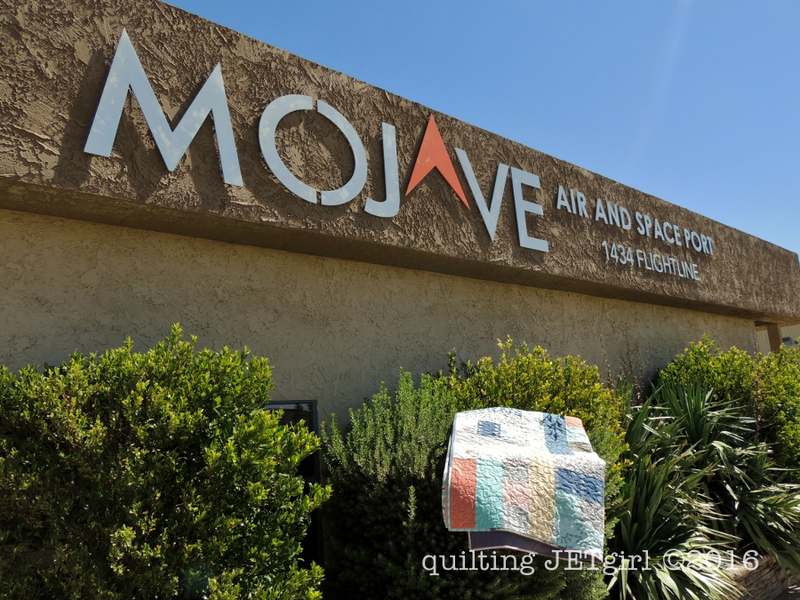 And since the fabric line is named Mojave, I figured the perfect location for the photo shoot for this quilt was in and around the town of Mojave, California. 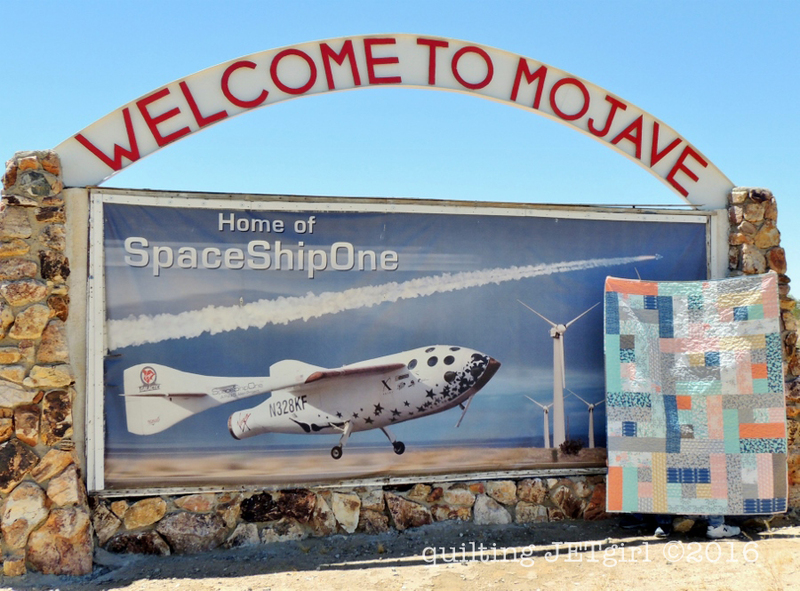 In fact, I moved to Mojave to work on the follow on project to SpaceShipOne; I was on the small engineering team that designed the SpaceShipTwo prototype, and the 2 sets of feet you can see peeking out from under the quilt belong to two of my former co-workers. Aside: My tagline, Sewing at the Speed of Sound, is a nod to my former aerospace engineering background and the fact that I helped design the second privately funded (non government) aircraft to break the sound barrier (the first being SpaceShipOne). The Bundle Buster pattern requires 16 fat quarters to create a 60″ x 80″ quilt top. The fact that I was working with a 19 piece fat quarter bundle meant that I could also make a scrappy binding for the quilt. What I like most about the Bundle Buster pattern is that it leaves very little waste from cutting a fat quarter, and the large pieces are perfect for showing off even large scale prints. The Hawthorne Threads fabric is high thread count, and I really enjoyed working with it. And the fabric was a dream to quilt. I used 50wt Aurifil 2605 (Grey) and quilted a fast and loose stipple / rounded meander. In fact, I was really surprised that it only took 1.5 hours to quilt this 60″ by 80″ quilt! For a total time of 6 hours and 30 minutes to make a 60″ x 80″ quilt! This church is iconic to me as a part of Mojave; I have friends who live in the church. They host pretty fabulous parties here and this building will always be one of the things I think about when I think of Mojave. So, what do you think? Do you have a fat quarter bundle ready to turn into a quilt? I will be celebrating this new pattern and finished quilt by linking up with Finish It Friday and TGIFF. When we read another blog, and look at dogs, farms, quilting, photography, we really don’t know much about who is behind . brilliant way you displayed your quilt there. That is an out of this world pattern. Love the Mojave colors. Yvonne, congrats designing for the stash builder box. 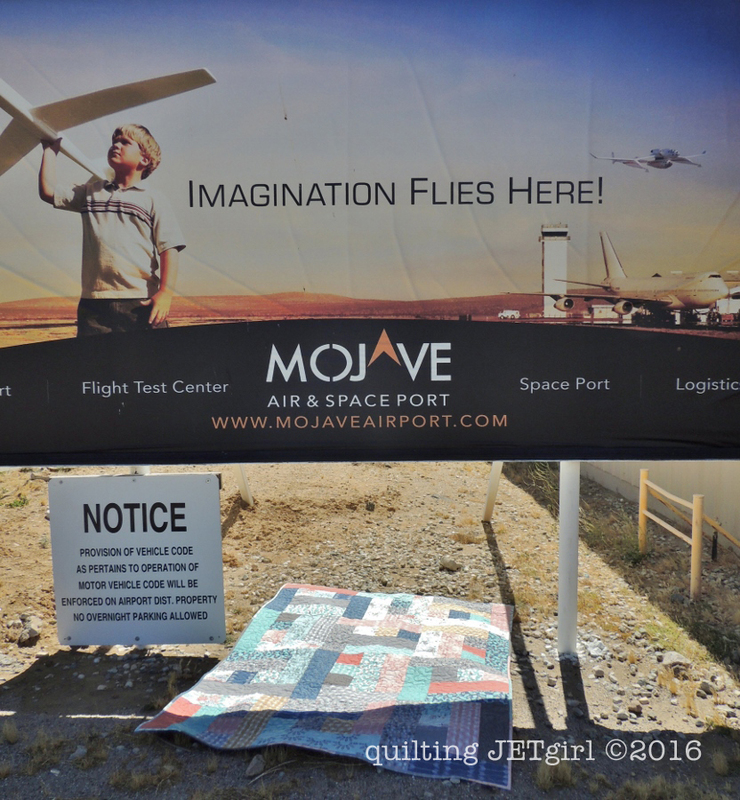 Looks like that fabric, Mojave, was just made for your neck of the woods (or desert). Beautiful fabric, my favorite print is the Cactus Field. I loved hearing about your previous work. Have I got a stash to bust! Your pictures are as always…perfect! I like that the pieces in this quilt are large so you can see the pattern in the fabrics! Great job and congrats! Congrats on another beautiful pattern, Yvonne! Your photography is so creative and it looks like such a fun day. Congratulations on being included in the stash builder box. I really like the fabrics in this line and your pattern nicely shows them off! It looks like a quick pattern, although I would never be as speedy and efficient as you! 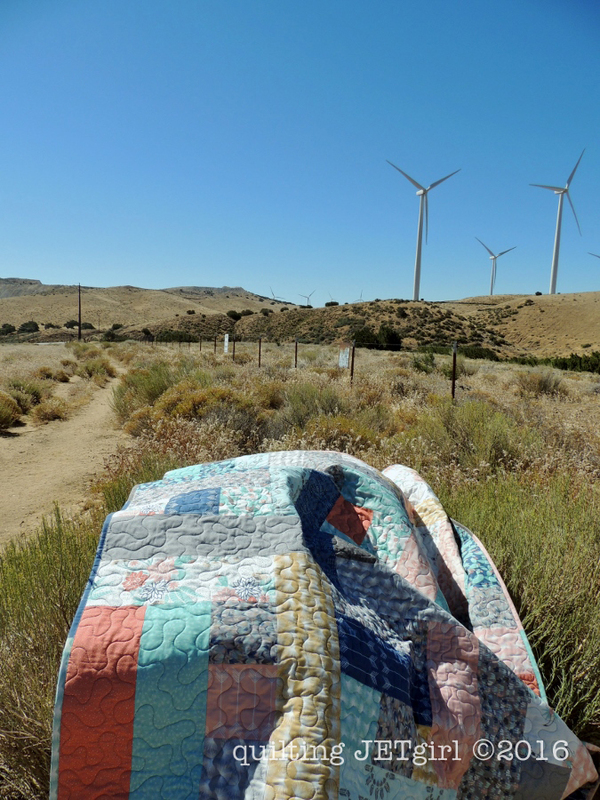 Every time we drive through Mojave, I’ll think of you and this quilt. Congrats on another great pattern! This looks like it would be perfect for using up those fat quarters laying around. And sometimes there isn’t anything better than a good old fashion stippling. It looks like your photo shoot was a blast, getting to visit all your favorite places around Mojave. All of the colors in the fat quarter bundle look so dag gone good against the desert background. Good Morning Yvonne! Bundle Buster is a great quilt! I truly enjoyed reading your post and finding out so much more about you. You are an astronomical person with so many accomplishments! Thank you for sharing and have a fantastic creative day! Very cool! I need to look at the Stash Buster…your quilt looks great and I like the photography! This looks like a great FQ pattern and I love your quilt! Quite a wonderful aerospace accomplishment also!! Great and what a fun photo shoot! Great pattern and photography! I love a good stipple, it gives such a nice texture to a quilt. 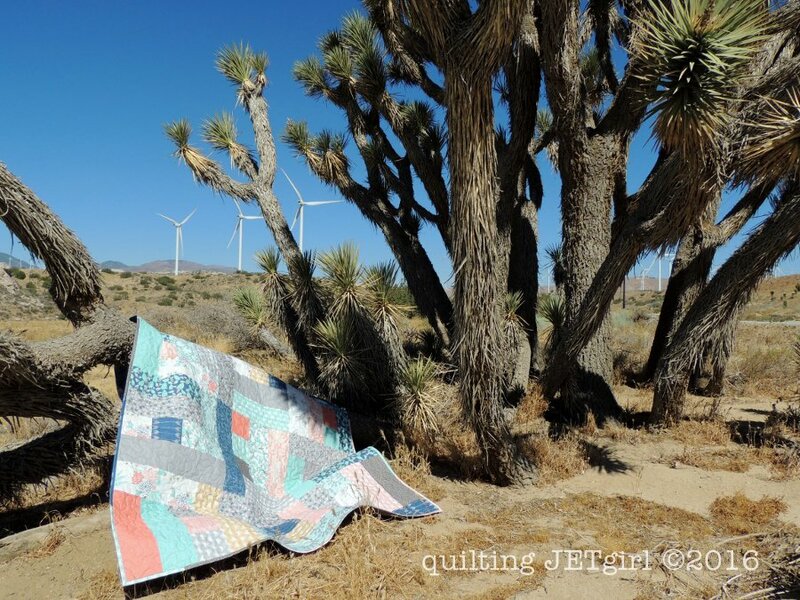 Those are great photos – love all the places you took the quilts! This is a great pattern for letting the fabric shine. Sadly, all of my fat quarter bundles have bits nibbled out of them. I must be a scrapper at heart. Awesome pattern when you need a fast gift and a perfect one for those gorgeous prints that need to shine! And I love your photographs! Congratulations on being included in StashBuilder Box. I review the July one and it’s a great product with a wonderful connection to charity which really touched me. Too bad I missed your pattern but everything in the box was great and well worth the price. Mojave is a great pattern and man those photos are awesome. It’s wonderful to make the connection to your engineering life and the name of your blog. Pretty quilt, and well traveled! What a wonderful backdrop for a photo shoot. The quilt is beautiful – the colors in this palette are really nice. Hahaha those feet under the quilt are a great little detail in the first photo (that spaceship is pretty cool too, I guess). And oh my gosh I want to live in a church!! There is a converted church-turned-coffee shop in VA I went to once and was totally in love. How did the HT fabric wash? It is kind of stiff at first, but I’m excited to finally be using some it in my grey and teal quilt! I’m hopeful it will soften in the first wash (I think I read that somewhere?). This pattern is perfect for beginners and bundles and novelty prints and fast baby quilts! OMG!!! I live in the Antelope Acres area of the Antelope Valley. The view from my sewing room faces the beautiful Tehachapi mountains and Mojave. Love my desert. I saw your quilt in an e-mail from Hawthorn Threads. It’s beautiful. I think I’ll have to order that fabric and make one for myself. Beautiful work!! Is this pattern available for purchase as a download or paper pattern?